Did you have a good long holiday weekend? I had an amazing weekend too! With my parents visiting with friends at the beach, I had a big Tex-Mex BBQ at my house with my close friends. It was a great time filled with good food and even better conversation. Coming from a long line of Greek cooks, I whipped up enough food to feed A LOT of people… which means one thing – leftovers. (yay!) I wanted to save the main stuff for a welcome home dinner with the parents, but there was just enough grilled veggies for me to whip up a delicious and easy lunch. I know that quesadillas are a traditional Tex-Mex dish, but I hate all cheese (have I mentioned that before?) except for mozzarella (yes, I’m weird). So I decided to try an Italian spin on this old classic using the leftover veggies and the one cheese that doesn’t gross me out (definitely stepping out of my comfort zone). It starts with a pan set over medium-low heat and coated lightly with cooking spray. 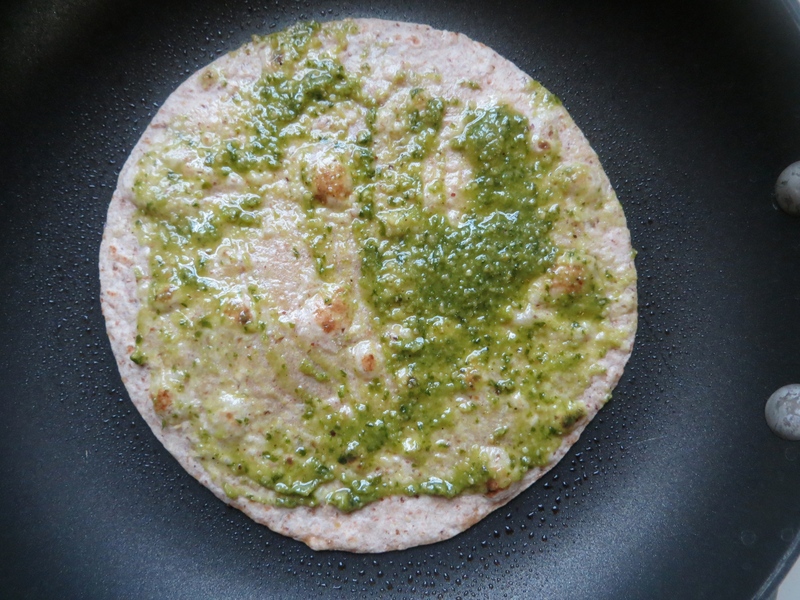 Place in a small tortilla – this is a 6” whole wheat one (I think they call it “fajita-style”) – that is spread with some pesto (homemade or bottled… your choice!). Sprinkle on some mozzarella cheese. Because what is a quesadilla without melty cheese? And then place on the grilled vegetables. Sprinkle on a little more cheese to help “glue” the quesadilla together. And then top with another tortilla coated with some more pesto! Grill the quesadilla until golden brown on both sides, about 1-2 minutes per side. All that’s left is to place the quesadilla on to a cutting board. Serve with a spoonful of your favorite marinara sauce and a garnish of basil. A simple, delicious, and interesting twist on the traditional Tex-Mex classic! Place a medium-sized skillet over medium-low heat. Spray lightly with cooking spray. Coat one side of both tortillas with pesto (one tablespoon per tortilla). Place one tortilla pesto-side up in the skillet. Sprinkle on half of the mozzarella cheese over the pesto and arrange the vegetables in one even layer over the cheese. Sprinkle on the second half of the cheese over the vegetables (to act as the “glue”) and top with the second tortilla, pesto-side down. Cook the quesadilla 1-2 minutes per side until it becomes golden brown and the cheese gets melty. Transfer the quesadilla to a cutting board, cut into wedges and serve with marinara sauce and some fresh basil. Hi there! How are you? How’s life? Are you enjoying the spring weather as much as I am? With the days getting warmer and the produce section at the grocery store filling with delicious things, all I want to do it buy it all and cook! My recent food purchases were one beautiful (and perfectly ripe) tomato and a tub of mixed baby greens with herbs in it (did anyone else know that this existed? Where has this been all my life?!). With some leftover (and slightly stale) ciabatta bread in the pantry and some white bean hummus in the fridge, an easy vegan sandwich popped into my mind. 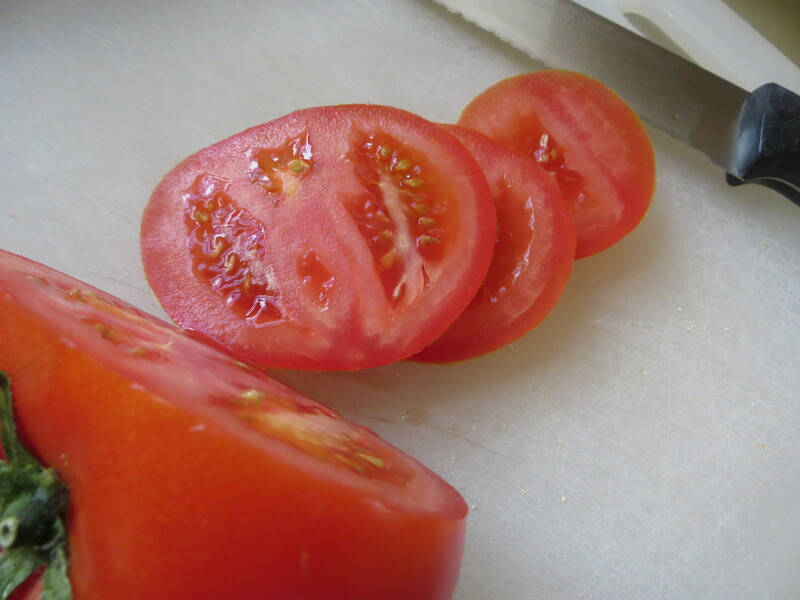 It starts with slicing up that beautiful ripe tomato. And stopping to eat a couple slices before realizing if you keep eating it, you’ll have a tomato-less sandwich. And who wants a tomato-less sandwich? Then cut a thick piece of whole wheat ciabatta bread and slice in half. Spread a good amount of hummus on the bread – I only did one side here, but spreading it on both sides would definitely be better! Then layer on some of the baby greens with the herbs. Fresh and green… just like springtime! Then layer on some tomato slices. Pop the lid on the sandwich. I love looking at all the layers – the nutty brown of the ciabatta, the white of the hummus, the greens and purples of the lettuce, and the bright red of the tomato. A easy lunch that celebrates the changing seasons. ½ cup mixed baby greens – if you can find the one with herbs in it, try it out! 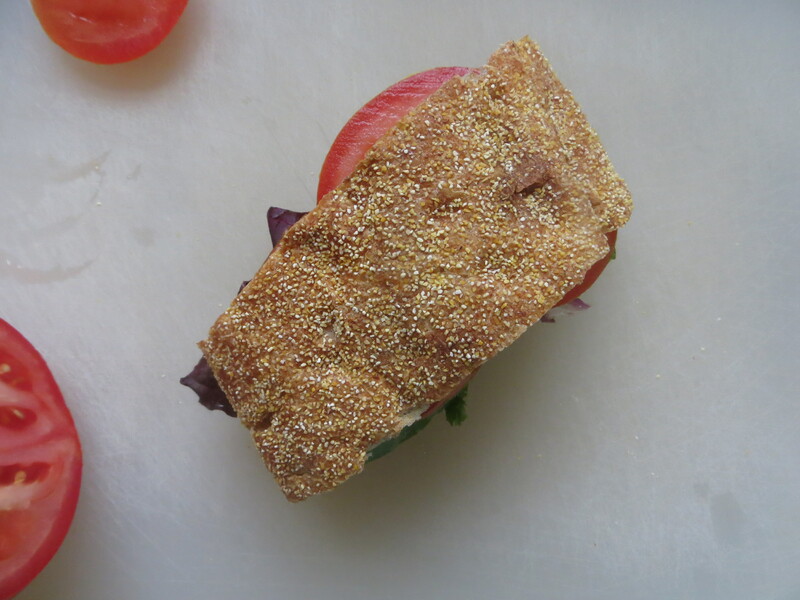 Lay both halves of the ciabatta on a cutting board and spread hummus over both halves (1½ tablespoons on each half). On one half, layer on the mixed greens and tomato slices. 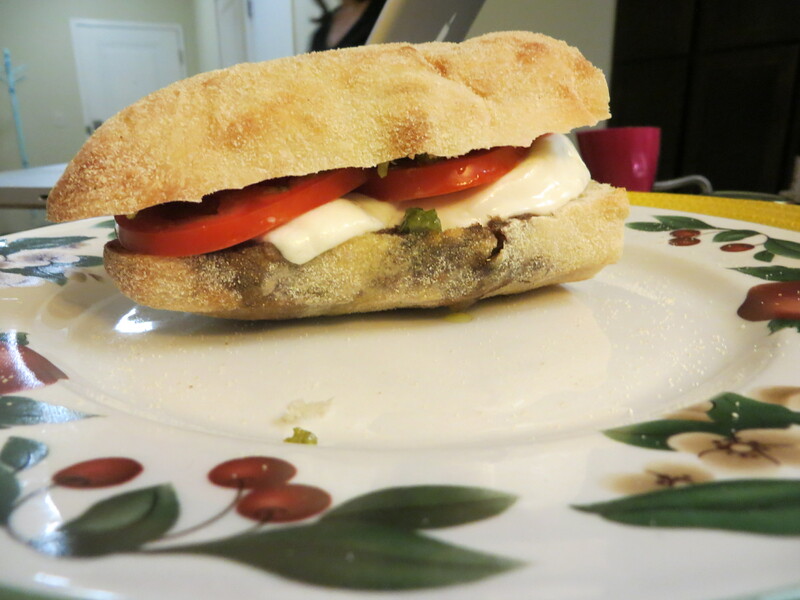 Top with the other half of the ciabatta, hummus side down. Slice in half and serve with a side salad or raw veggies. 1. Add rinsed, drained white beans, garlic, vinegar, salt, pepper, ½ cup of olive oil, and as much hot sauce as your heart desires. 2. Puree – add more olive oil (up to another ¼ cup) until you reach the consistency you want. 3. Taste and adjust seasoning – add salt, pepper, and extra hot sauce. 4. Serve with pita chips, raw veggies, or use as a spread for sandwiches and wraps! As much as I like to (and will) eat the same thing for dinner 4 days in a row, there comes a time when I can’t eat another bowl of chili or piece of grilled chicken. For me, leftovers provide endless possibilities to be transformed into something awesome (and so not boring). Like my Greek Grilled Chicken. For Fourth of July, I cooked up enough for 12 people when there were only four people coming over… in addition to hamburgers and hot dogs. Needless to say, I had a lot of chicken left over. So for lunch, I decided to whip up an easy sandwich that used up my leftovers and gave new life to plain old grilled chicken. Pesto + chicken + tomato + amazing bread = yumminess that can be consumed one-handed as you finish all the work for your summer class! And it started with good bread. I bought this amazing whole wheat sourdough bread at the farmer’s market in town and it is probably my new favorite food product. Nutty, tangy, and just perfect for sandwiches. Then you spread a generous layer of pesto on each slice. 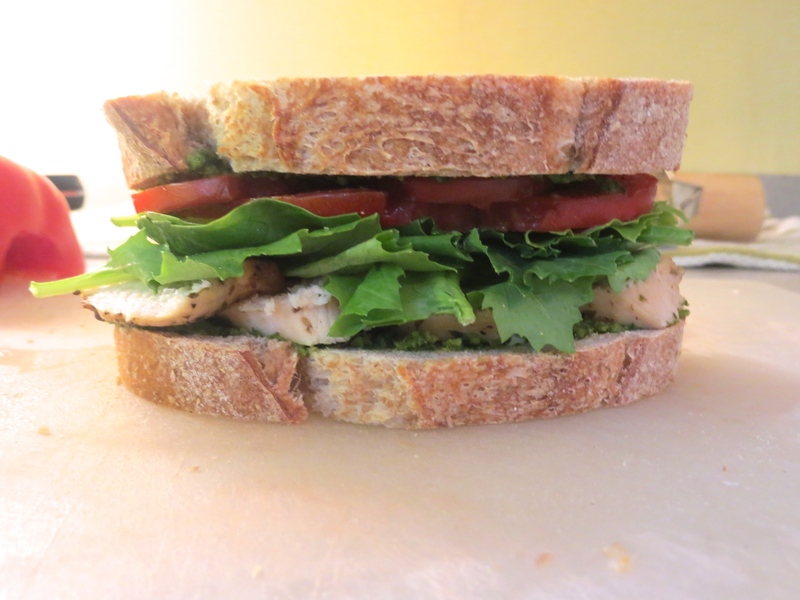 I love how the green of the pesto looks against the nutty brown of the bread. Slice up some tomatoes (another farmer’s market purchase!). Layer a couple of slices on one side of the bread. I like thick slices of tomato on my sandwiches. place some slices grilled chicken. Then step back and admire your progress. Because both the chicken and tomatoes have moisture in them, if I put this sandwich together and took a bite, something would inevitably fall out or the sandwich would slide out of place. So I needed something that was slightly rough and dry as a buffer zone. And nothing does the trick like some mixed greens. This is a mix of baby kale, baby swiss chard, and baby spinach. Divine! Then you put a lid on it! Look at all those beautiful layers. Perfect with a side of cut-up tomatoes (or if you have them, some hot French fries…). Spread pesto on both slices of bread. On one slice of bread, layer tomato slices. On second slice of bread, place chicken slices. Add mixed greens. Put the sandwich together, slice in half. Enjoy with a side salad, cut-up raw veggies, or some French fries! I usually don’t participate in “Man Crush Monday” and “Throwback Thursday” on social media, but today I want to share my food “Flashback Friday”. 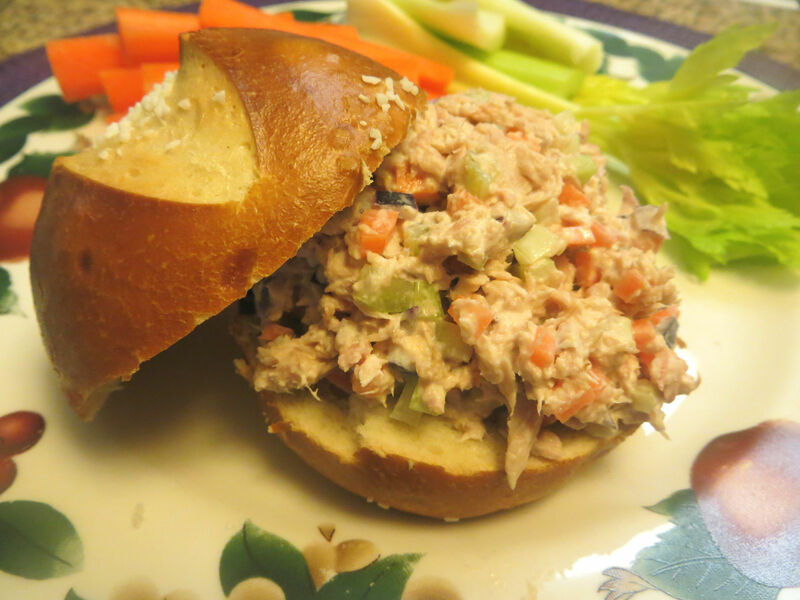 This is a tunafish salad sandwich. But not just any tunafish salad sandwich. I remember eating this sandwich over 10+ years ago at the food court in Metropolitan Museum of Art in New York City. Let’s set the stage. I am about 9-10 years old, visiting the museum for probably the 100th time – as a kid (and as a grad student today), I loved visiting museums. Natural History, art, glass blowing, spaceships, etc… if it had a museum, I wanted to go there and go back many, many times. The Met was always a good compromise because The Sister and my parents to go and see the statues, textiles and clothing, and paintings. I liked going for the sizable Egyptian collection and the food options. Usually, we would have our lunch like real New Yorkers – munching on hot dogs slathered in ketchup and hot soft pretzels on the steps in front of the Met (my favorite!). But this time, my parents took us to the food court that was located in the middle of the museum. The food court has since moved to the basement of the Met, but when I was a child, it used to be where the new Greek and Roman statue collection resides today. It was all marble, floors, walls, ceilings, and had plants and greenery scattered around. To my child eyes, it was the best food court in the world. Sitting down to lunch, I told my parent (don’t remember who it was) that I wanted a tunafish sandwich. And I got this masterpiece. 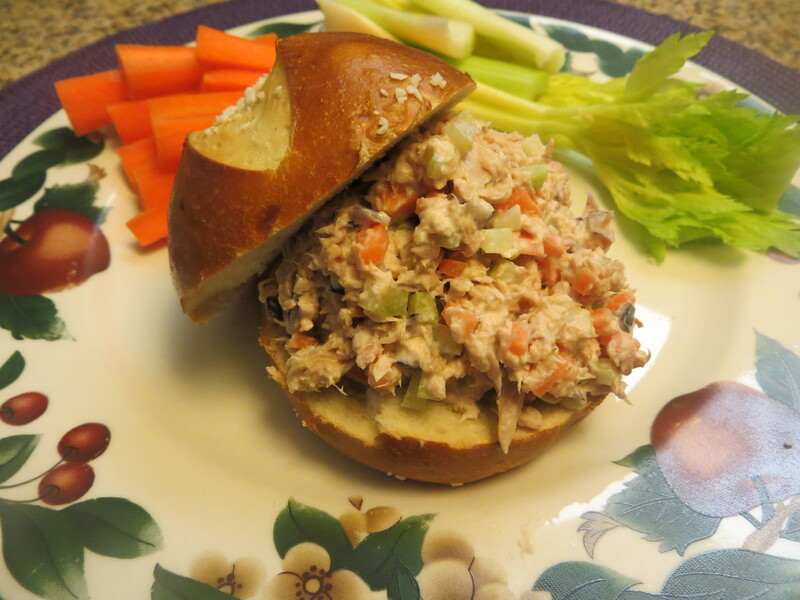 Three simple ingredients elevate it past normal canned tuna and greasy mayo. 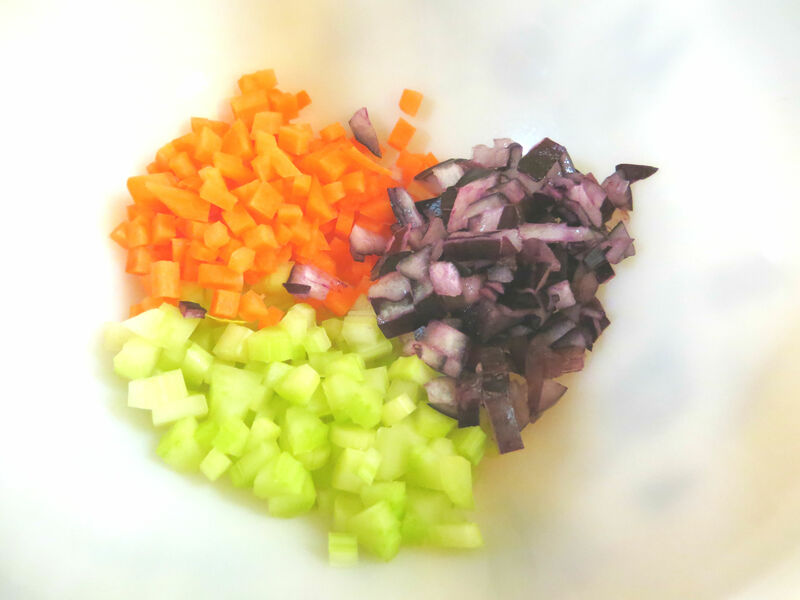 Carrots provide a nice sweetness, celery gives the sandwich crunch, and red onion gives a spicy kick that is still child-friendly. 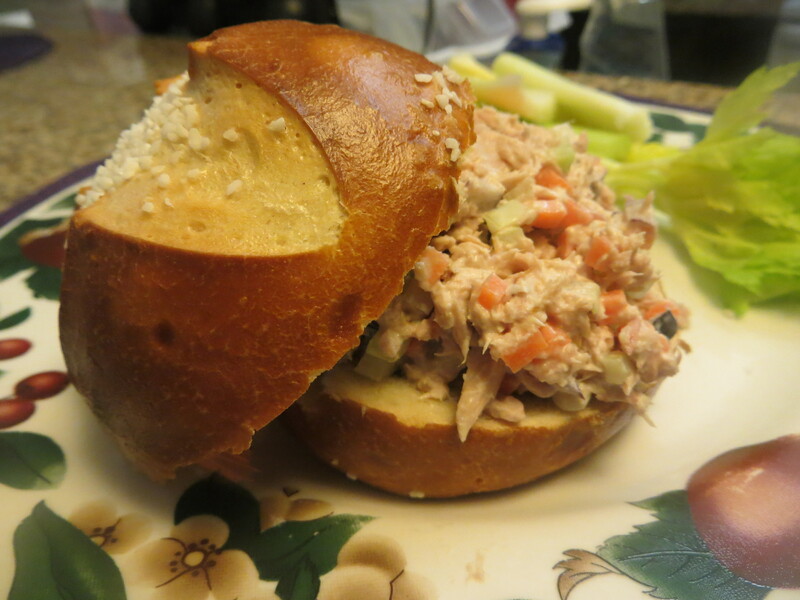 Every once in a while, I make my Met Tunafish Sandwich, combining the magic ingredients, tuna, and good quality mayo (and sometimes adding my own flair of hot, pickled banana peppers). Then pile it up high on a good quality roll. The Met served their sandwich on a brioche roll, but my supermarket has started baking pretzel rolls, so I grabbed one for today. The saltiness was perfect with the heaviness of the mayo and it celebrates my favorite NYC street food, the soft pretzel. It is my perfect sandwich and one of my favorite food memories. What is your favorite “Flashback Friday” food memory? Is it a perfect gelato sitting in a piazza in Rome? Biting into a fresh tomato you grew in your garden? Have a great weekend, kiddos! My sister is awesome. She is super smart. She is driven. She is outgoing, kind, and a multitude of other amazing qualities. She also is a perfectionist, which means that I was roped into helping her reshoot a video spot about my crazy career flipping (I wrote about it last year! She ended up getting an A on the original… YAY). When she called in a tizzy on Saturday, I knew that I had to help her out (because that’s what family does). The premise of the video was identical to the original, but instead of whipping up chili and cornbread (because I was out of ingredients and was super lazy that day), I made tomato-mozzarella sandwiches. And they were awesome. The video making was awesome too – E used my camera to shoot everything, so I was back to taking pictures with my iPhone. So I apologize now for the blurry shots – the camera really does not work the same after you have dropped it into a bowl of frosting. 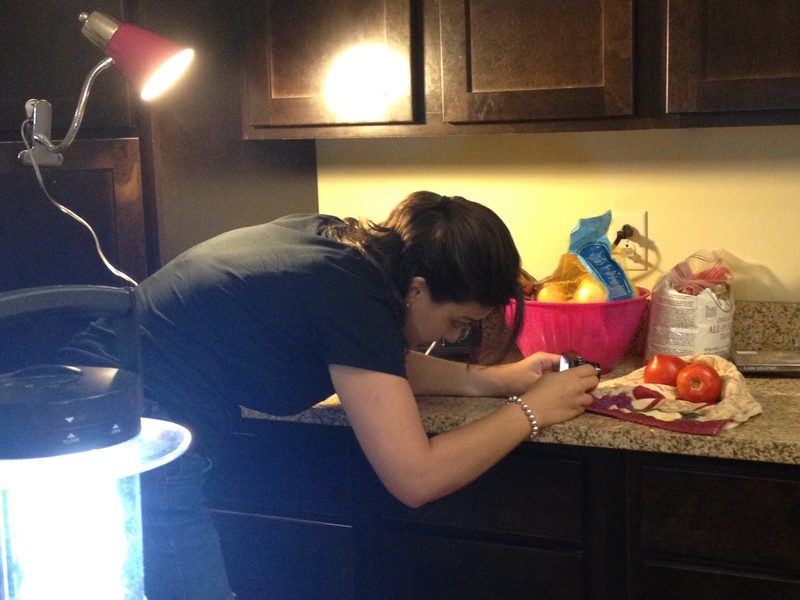 Here is a shot of E taking a close up of the tomatoes. My kitchen is horrifically dark, so we pulled out my camping lantern and my clip-on light. 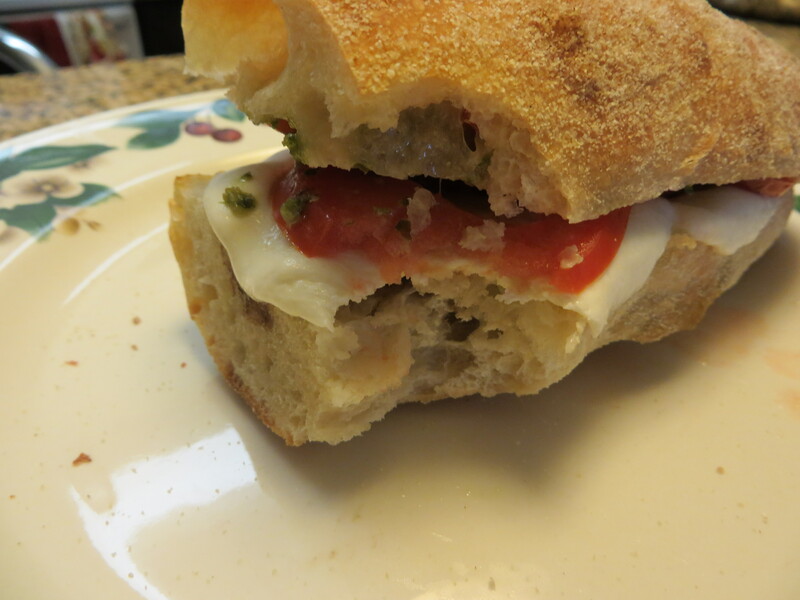 Since E needed a lot of shots to piece together a story, I made fancy tomato-mozzarella sandwiches. When I’m in a hurry, the sandwich consists of bread drizzled with olive oil and vinegar, a couple of slices of fresh mozzarella and tomato. Place sandwich in mouth and run out the door. BUT this sandwich was the product of time and tender loving care. Instead of drizzling oil and vinegar quickly (and getting it on the floor, countertops, and cabinets in the process), I slowly poured it over the bread slices and topped it artistically with the mozzarella slices. 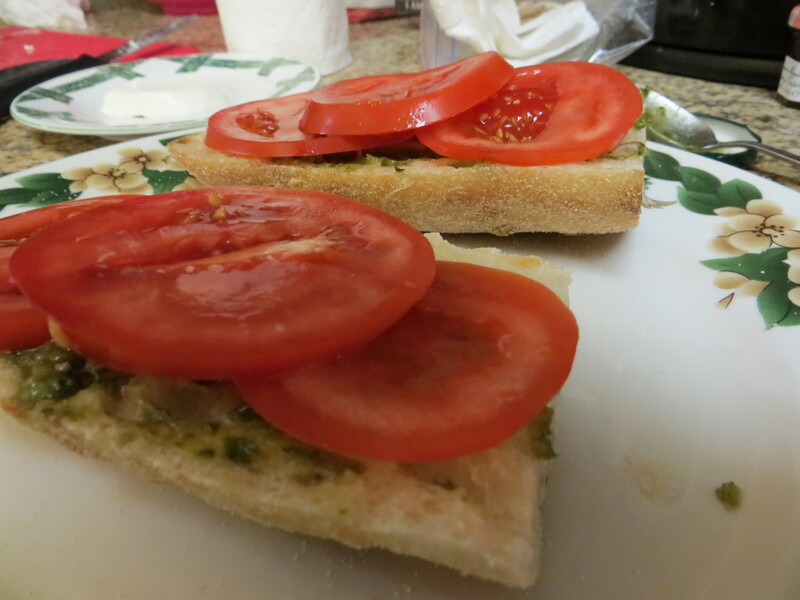 I gently spread the other slice with pesto and topped it with tomatoes (see the picture – I’m super proud of my tomato stacking!). I even placed the mozzarella-covered slices under the broiler so that the cheese melted into oozy, cheesy wonderfulness. It wasn’t just a sandwich… it was a masterpiece. Which we proceeded to inhale in approximately 6.74353 minutes. Hanging out with my sister is always a good time, and helping her out with a project always makes it more fun. Maybe in the future we’ll get a TV show together. And eat tomato-mozzarella sandwiches.